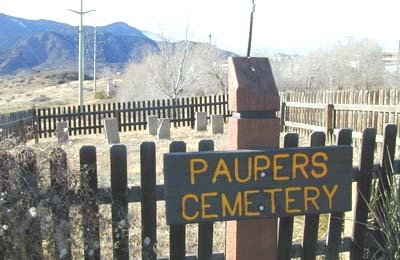 The Paupers Cemetery is located on the west side of Colorado Springs. Take Highway 24 west to 21st Street, turn south and go approximately one mile. The cemetery is on the southwest corner of Lower Gold Camp Road and 21st Street on Colorado Springs park land. According to GPS-derived geolocation (accurate to within 10 meters), the cemetery's coordinates are latitude 38°49'41.5"N and longitude 104°51'34.0"W.
The fenced area contains seven headstones, but none has any information. Paula Megorden of the nearby Bear Creek Nature Center says the center does not have the names of the paupers, but does offer the following information: Both the rich and poor who died from smallpox are buried here. The remains were moved to this spot from a short distance away during the construction of 21st Street in 1957. The last case of smallpox in Colorado Springs was in 1942. A Colorado Springs Gazette Telegraph article at the time of the discovery of the graves (April 24, 1957, page 1) noted that the graves were originally on county poor farm property and records of the burials were destroyed when the farm's first hospital burned January 20, 1900. The article identifies one burial as that of Henry Parks, 46, a resident of the farm from July 7, 1899, until November 10, 1900, when he died after an epileptic seizure. He was born in Arkansas. A smallpox hospital in the area had been torn down several years before, the article notes.